The last century has witnessed extant studies on the applications of Management Science (MS) to a diverse set of Supply Chain Management (SCM) issues. This paper provides an overview of the contribution of MS within SCM. A framework is developed in this paper with a sampling of MS contributions to major SCM dimensions. Future research directions are presented. The use of data mining in supply chains is growing, and covers almost all aspects of supply chain management. 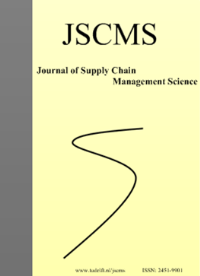 A framework of supply chain analytics is used to classify data mining publications reported in supply chain management academic literature. Scholarly articles were identified using SCOPUS and EBSCO Business search engines. Articles were classified by supply chain function. Additional papers reflecting technology, to include RFID use and text analysis were separately reviewed. The paper concludes with discussion of potential research issues and outlook for future development. The objective of this paper is to provide an inventory of approaches to descriptively (as opposed to normatively) model logistics decisions within the context of freight transport modelling. Rather than taking transport modelling frameworks as a starting point, as has been the case in the literature so far, we depart from a framework of logistics decisions. The framework is developed by combining elements of over a dozen existing frameworks from the supply chain management literature. Based on this comprehensive framework, we review freight modelling approaches from the literature. We find that freight modelling can be extended by taking into account previously uncovered areas of logistics decisions, such as those related to marketing or logistics systems forecasting and planning, as well as in areas that are well known from an optimization perspective but not from a descriptive perspective, such as routing and scheduling decisions. We conclude with a systematic listing of such areas, which can be used by researchers and transport modelling practitioners to develop further those transport models that take agent decision making as a starting point.